Regular readers will already know that dowsers believe the subconscious mind knows what is best for the body. This includes food, medicines, healing, colours, all sorts of things. The idea was demonstrated very powerfully when Melanie Lewis visited us on Thursday 12th February to talk about Aura-Soma oils and unguents. Members and visitors were invited to choose from 106 beautiful bottles containing two liquids: the top half was a highly perfumed olive oil derivative containing essential oils, and the lower half is the purest water that can be found, purified again, and both in the loveliest jewel-like colours. As we all learned at school, oil and water don't mix, so the two remain separate unless vigorously shaken to form an emulsion and even then, separate out again very quickly. However, there is more to these liquids than meets the eye because they are imbued with healing properties from crystals. The colours match those of our seven chakras, which echo the colours of the rainbow, and you are very much the colours you choose. For example, someone who has recently suffered a bereavement, is not sleeping well, and feels stressed, is very likely to choose the deep blue oil with a pretty pink water. This is the subconscious mind choosing what it needs - lavender, which is associated with relieving all those things. And pink which brings with it kindness, caring, warmth and being gentle with yourself. For dowsers, however, the exciting part was when Melanie invited a couple of volunteers to select the colours that spoke to them, (colour blind and blind people can intuitively choose too), and briefly hold them. Our most experienced dowser, Chairman Peter Golding, asked his rods to show the edge of the aura of each volunteer before they chose their colours, and again after they had briefly held them to the heart. The increase in the size of the aura before and after - denoting an increase in wellbeing - was measurably significant, at least 9 or 10 inches. 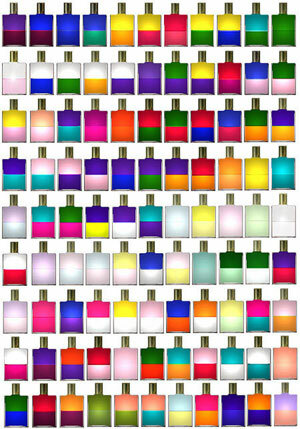 There are different products for different purposes, such as a paint additive, shower gel, pomanders and quintessences. They are quite expensive to buy and you need a consultation with an experienced practitioner, but this was not a selling exercise. Melanie was happy to simply tell us, a receptive audience, about these wonderful products. And even the most determined cynic could not deny, they smelled absolutely wonderful.